Preload Anno 1800 Open Beta Now And Try It For Free - WebGamer.NET | The Website for Gamer. Returning to the Industrial Revolution in the 19th century. 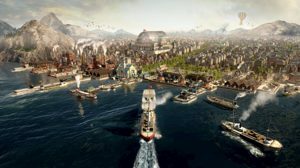 Ubisoft announced that the Open Beta for Anno 1800 will be open to everyone, the title will be the franchise's 7th city building simulator. PC Has anyone's preload started? Classic Does anyone know if the Nintendo switch comes with any games preloaded?